To all you moms reading, I hope you had a wonderful Mother's Day yesterday 😊 The highlight of my day was when Nathan gave me the gift he planned and bought all on his own...a spool of gorgeous blue thread. Little things like that are enough to melt my heart! As Mother's Day approached, I kept thinking about a woman in the Bible named Hannah. You can find her story in 1 Samuel 1. Hannah was married to a man named Elkanah and she had no children. We don't know how long they had been married, but it was definitely long enough that there should have been several children and the lack of a child was heartbreaking for Hannah. Nowadays women who deal with infertility suffer intense disapointment, frustration and more. In Hannah's day, she would have dealt with not only her own emotions, but also the judgement of her whole society. At that time, a woman's biggest purpose was to bear children and not doing so was seen as a black mark against her. Being declared 'barren' was an awful stigma to bear. To make matters worse, Hannah was not Elkanah's only wife. "Elkanah had two wives, Hannah and Peninnah. Peninnah had children, but Hannah did not" (1 Samuel 1:2). And "Peninnah would taunt Hannah and make fun of her because the Lord had kept her from having children" (v. 6). Can you feel the awful weight of heartbreak Hannah carried? So Hannah prayed. Verse 10 says she "was in deep anguish, crying bitterly as she prayed to the Lord." Hannah prayed, "O Lord of Heaven’s Armies, if you will look upon my sorrow and answer my prayer and give me a son, then I will give him back to you. He will be yours for his entire lifetime, and as a sign that he has been dedicated to the Lord, his hair will never be cut" (v. 11). And God answered her prayer, giving her a son she named Samuel. What joy she must have felt! Then, after Samuel was weaned, she fulfilled the promise she had made to God. When the family again traveled to worship at the Tabernacle, she took Samuel with her and went to Eli the priest, telling him, "I asked the Lord to give me this boy, and he has granted my request. Now I am giving him to the Lord, and he will belong to the Lord his whole life." (vv. 27,28). "Then Elkanah returned home to Ramah without Samuel. And the boy served the Lord by assisting Eli the priest" (1 Samuel 2:11). She gave Samuel back to God, leaving him to be raised in the Tabernacle where he would serve God every day. Thankfully, we aren't called to give our kids to our pastors so that they can serve in the church all the time, but we are to do our best to raise them to serve God. While talking about the commands God gave him to give the people, Moses said, "Repeat them again and again to your children. Talk about them when you are at home and when you are on the road, when you are going to bed and when you are getting up" (Deuteronomy 6:7). Our goal is to teach our kids about God in such a way that they will want to follow Him too. And don't despair if your kids are grown and out on their own, but not yet following Him. You still have opportunities to share God with them whenever you talk to them (texting counts!). I heard one mom say that she would occasionally send her son links to Christian songs that she was really enjoying and that sometimes he would go and listen to them. 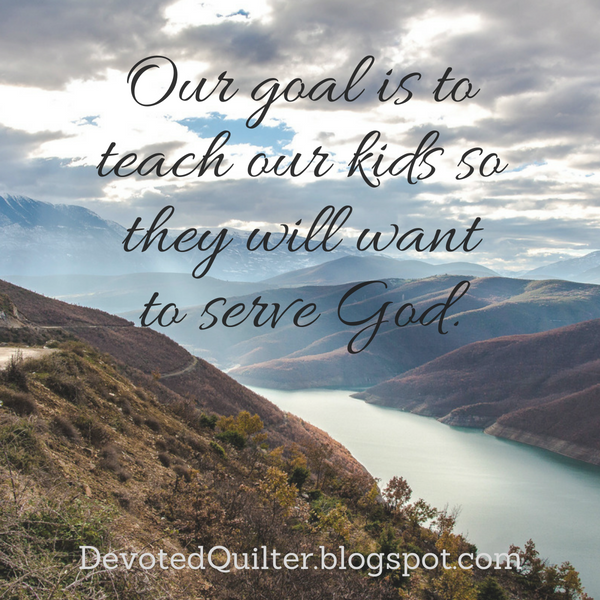 What is your best strategy for teaching a child (of any age) to serve God?